We are excited to announce the Humane Society of Sheboygan County’s Pet of the Week! 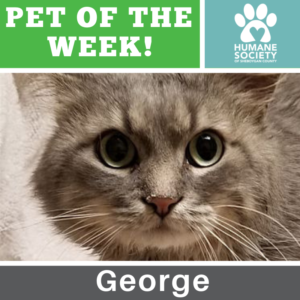 George is a compassionate kitty who loves snuggles and curling up in laps. Quiet time is George’s idea of a good time. Due to some unfortunate circumstances, George recently lost his best friend in the whole world. Needless to say, he feels a bit out of place here and needs his hero to come save him. He wants all prospective owners to know that they should stop by and say hi because he is a really cool cat! Find out more about George here.